Annan finished 2017 with a hard earned victory over Edinburgh City in a result which keeps Annan just outside the play-offs and leaves City struggling at the lower end of the table . The match turned out to be excellent entertainment for the sparse crowd which had braved the damp wet weather with Edinburgh City pushing Annan all the way and no doubt the City supporters will look back to the final minute when they had the ball in the net only to have the goal disallowed for offside. Annan went in front in the 13th minute with a route one goal which stretched the City defence when Blair Henderson flicked the ball over the City defence and into the path of on loan striker Ross Ferguson who slipped the ball past the advancing Callum Antell in goal for City. It was a simple goal in the making which gave Annan an early advantage but it was the visitors who started to gain the upper hand as they went all out to square the game. Annan had James Creaney to thank in the 24th minute when he cleared Lewis Allan’s effort off the goal line. It was a let off for the Annan team but City squared the match minutes later with a well worked goal created down the right by on loan Falkirk wide man Craig Thomson whos low cross picked out Farid El Alague who finished superbly with a stunning low volley from 10 yards. It was just reward for City who had worked hard to get back into the game. It was turning out to be a good contest between two evenly matched sides and as the game approached the final 10 minutes of the half it was Annan who gained the upper hand and in the 34th minute. Aidan Smith won a corner on the left from which man of the match Swinglehurst missed a glorious opportunity when he somehow headed past the post from a Moxon corner when it looked easier to score. At the other end Annan had keeper Alex Mitchell to thank when he pulled off a fine save to deny ex Hib’s man Lewis Allan after the Annan keeper pulled off an important save at full stretch to turn the effort round the post. Athletic then carved open the City defence ending with Rabin Omar setting up Blair Henderson in the 35th minute but the finish from the Annan striker was disappointing leaving Antell with a fairly routine save. The opening 10 minutes of the second half were evenly contested but gradually Moxon and Omar were winning the battle in the middle of the park and in the 60th minute it was Moxon who held the ball up well before squaring the ball to Jack Brannan who’s well struck shot from 20 yards appeared to take a nick off one of the City defenders and the shot caught keeper Callum Antell flat footed. It was a good spell from Annan who were stretching the visitors defence in the 65th minute Omar threaded the ball through to Aidan Smith who effort was diverted for a corner from which Swinglehurst once again headed narrowly past the post. City brought on all their substitutes as they saw the game slipping away from them but in the final ten minutes of the match the visitors started to create a few anxious moments in the Annan defence. Mitchell pulled off saves from Craig Beattie and Marc Laird and right at the death City managed to get the ball in the net only to have the goal ruled out for offside. 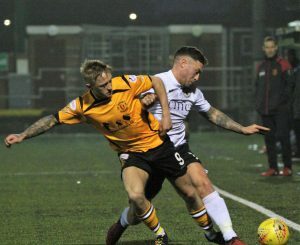 The victory for Annan extended their unbeaten run to eight matches which is a new club record, and although they have played more games than the teams around them they are well placed for the second half off the season. Annan are without a match next Saturday and their next game is on Tuesday 2nd January when they travel to Broadwood to take on Clyde a team Annan have still to defeat this season. ANNAN ATHLETIC – Alex Mitchell, Jack Brannan, James Creaney, Owen Moxon, Scott Hooper, Steven Swinglehurst, Dan Orsi ( Brandon Luke 75min) , Ryan Sinnamon, Aiden Smith , Rabine Omar, Scott Roberts ( Blair Henderson 87 min). Substitutes not used Jim Atkinson (gk), Ayrton Sonka, Peter Watson, Shaun Bell, Robbie Hogg, Peter Murphy. EDINBURGH CITY – Callum Antell, Jordan Caddow, Joshua Walker, Marc Laird, Craig Thomson, Ashey Grimes (Craig Beattie ), Liam Henderson, Farid El Alague, Scott Shepherd ( Callum Hall 74 min) , Stuart Morrison, Lewis Allan (Gavin Malin 70 min) . Substitutes not used: Fraser Morton GK, Christopher McKee, Moses Olanrewaju, Kieran Watson . Referee – David Lowe Assistants – Graham Chambers and Drew Kirkland. Montrose like Annan are a team on form and they extended their unbeaten run to 10 matches with a single goal victory over Stirling Albion and the Angus side currently occupy top place in the league . Peterhead maintained their pressure on Montrose at the top of the league with an injury time winner over Cowdenbeath. Stenhousemuir defeated Elgin City 4-1 to keep the pressure on the top teams. Clyde and Berwick Rangers shared the points in a no scoring draw at Broadwood.